Designing a new kitchen for your home? 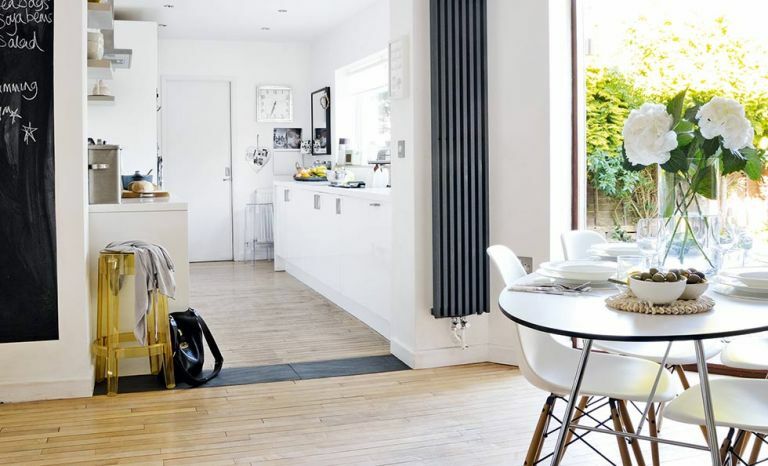 Be inspired by this stylish budget kitchen diner – and check out all our room transformations for more clever ideas. After an ambitious two-storey extension to Nicola Wilkes and Stuart Davies’ 1960s home left them squeezed for funds, the couple had to get creative when it came to installing a new kitchen at the end of their renovation project. They couldn’t ignore the fact that, as a family of five, they needed to update the crumbling kitchen. This was where the couple decided to strip back their ideas, creating a design in keeping with Nicola’s love of Scandinavian interiors. ‘We kept the basics plain and simple, opting for a reasonable kitchen then spending a bit more on finishing touches, such as the tiles, kitchen lighting and furniture,’ she says. ‘It’s lovely to spend time in. During the summer we have the bi-fold doors open, and in winter we have lanterns all along the window, which gives a cosy glow. We are so pleased with our new space – it really works for us.’ Says Nicola.